Belmont Hill supports many non-profit agencies and causes throughout the year. Our goal has always been to provide ongoing support to these groups, while developing a strong relationship with them along the way. New initiatives and programs are added carefully, and mostly at the suggestion of the students, who then take the responsibility for educating our community and leading that particular project. 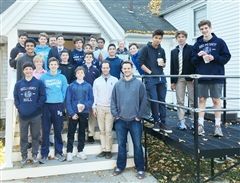 While we have "no dessert days" (twice a month) and "dress-down days" (twice a year) as fundraisers, the designation of these monies is voted by one of our middle and upper school community service committees. While we may sell products to raise money - such as cookies for breast cancer awareness and flowers for Valentine's Day for Dana Farber - we purposely do not solicit direct funds from our parent body. Our focus has always been on giving of time, talent, energy and donated items.